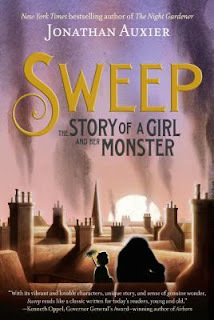 I saw buzz start to build around Sweep: The Story of a Girl and her Monster by Jonathan Auxier start to build several months ago. Now that I've read it for myself, I completely understand why so many people were talking about it. "We save ourselves by saving others." In Victorian London Nan lives a life of danger where she could die any day. She is a sweep-one of those unfortunate children who earn a pittance of money climbing up chimneys to make them clean and safe. Fortunately Nan is good at her job. But even being good at her job doesn't mean she has a good life. She is apprenticed to a harsh master and is haunted by dreams and memories of her Sweep-the man who raised her until she was six, taught her the trade, and then disappeared one night leaving her with nothing but a small clump of charcoal to remember him by. One day when a job goes horribly wrong, her little lump of char saves her life. Nan finds herself alive and awake in an attic with a small golem newly born and trembling in a corner. Now Nan finds new purpose in her life as she finds a way to take care of this new life she is responsible for. As Nan does this, she learns more about herself, her Sweep, and the world around her. In many ways Nan is the perfect MG hero. She is smarter and better-the exceptional child that stands out to the adults who come in contact with her and are paying enough attention. Like she is destined for something. What is different about Nan in terms of her role as a MG hero is that she is the sort that gets comfortable in a situation and is perfectly willing to stay there as long as she is surviving. That is what she spends the majority of the novel doing. Just surviving. It's not a very meaningful existence-which is the entire point and Auxier made it well. Nan consumes things and doesn't much care for the long-term consequences. She doesn't think about tomorrow-just today. Even once the monster, who she names Charlie, comes to life, that is slow to change. But as Nan begins to care more and more for Charlie, she begins to understand the importance of connection, planning for the future, and community. There is a boy who sells used good named Toby whose feelings she has always been negligent with. As a result of her adventures with Charlie, Nan allows Toby into her life more. Because Charlie needs certain things, she makes connections with others to get them. In doing so Nan begins to see that the world is more than what is just in front of her. It is an excellent character journey. The story is told with flashbacks to stories of Nan and the Sweep from when she is little. Each story is a piece to the puzzle of who she is and who Charlie is and how he came to be. Toby has some pieces of that puzzle as well. It is an intriguing read and there was enough action that the book is engaging and difficult to put down from beginning to end. The themes of community and what we owe each other as humans are not always subtle, but they are always delivered in a way that is perfect for where they are found in the plot. The whole concept of the golem is executed in a way I've never seen before, and Charlie is, to me, the best part of the book. So yes, I enjoyed this. And yes, I see why it was getting so much buzz. Yet there was also a part of me that was slightly removed from it all. I think it's partly because Nan was rather uninspiring as a character (which I get is the point, but it still caused a level of removal from the emotion for me). Also it's partly knowing where it all had to go in the end and so not wanting to get too invested. That's one of the drawbacks of being an adult reader. This is one of this books that could possibly change a kid and haunt them for life in the best possible way though.